Just like clothes, the haircut is a very important aspect in a little boy’s early days. If your little boy has a curly hair don’t be sorry! Rather try the below curly haircuts for little boys that’ll make him look even better! Little boys scampering all over the house can be a matter of both joy and terror. But you love them anyway. They are full of life and bursting with ideas, learning new things and picking up nuances from anyone and everyone. Little boy’s curly haircuts need to be designed keeping in mind the hygiene, school rules and the ease of possessing. If it is not comfortable or against the mandated style (some schools do impose these rules) you may have to change the haircut all over. Also, you cannot choose something ridiculous for the sake of permitted styles or ease of managing, as we all know how vicious little boys can get when it comes to teasing and ribbing. 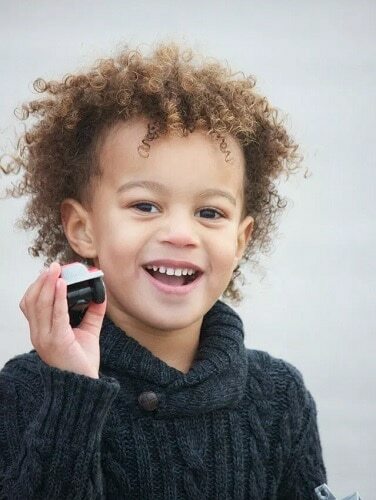 Here is a list of the best little boy curly haircuts that you may draw inspiration from. Little boys with curly hair are blessed! You need not fuss too much over their hairstyle. All you need to do is to ensure that all the hair is of the same length, so when you cut the hair, do take into consideration the curl of the hair. Be careful to keep the region behind the ears clean. If your boy has wavy to curly hair, then you can take up this hairstyle. It is a cleaner version of the cherubic cut, except that the sides and the back of the neck are kept clean. This gives an impression of a full head of hair, without making it look sloppy. Much as you may want it to stay cherubic, ahead of curly hair can get boring after a time. You can simply snip them an inch then, with deeper cuts of the sides. This gives a beachy look to the head while keeping the overall style crisp and neat. Curly hair can be made to blend with some hairstyles that are deemed good for straight hair. One of them is the fade. 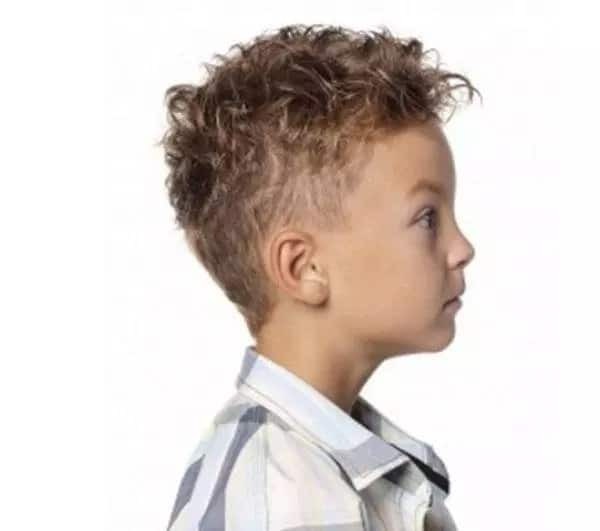 Little boys with a head of curly hair can opt for a high fade with sharp edges and then top it off with short curls. This hairstyle not only manages the curly mess but also makes this conventional hair type pretty cool. A thick mass of curly hair is a tremendous resource. You can trim it the way you like, with amazing results. 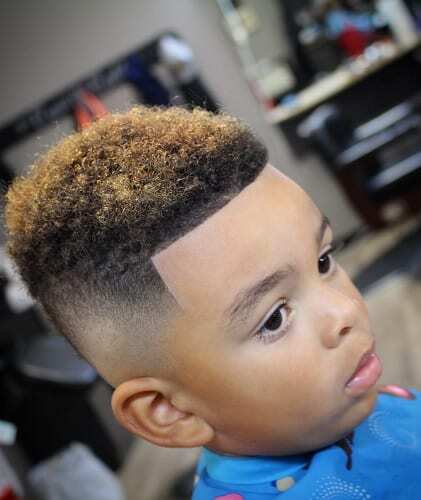 One of those little boy haircuts is the plateau cut, which starts behind the ears in a fade and terminates at the top with a thick block of curly hair. The added charm is the perfect level cut to the hair of the top so that it looks like a flat line. 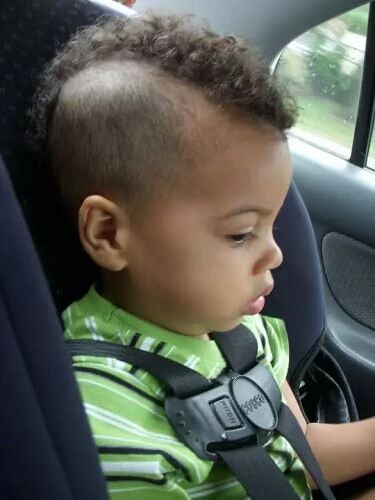 Mohawk and curly hair can be a deadly combination for little boys. The logic and process are the same; the sides begin with a burst fade moving up high, where the Mohawk is created, all the way from the front of the head to the nape of the neck. Curly hair is possibly the best kind of hair to try the undercut in. The stub of the hair on the sides high up generates a sharp contrast with the shock of curls and wavy hair up top. The balance between the two layers is adorable. This one is a simple yet very sweet hairstyle for your little boy. You can have the hair chopped in a regular fashion at the sides and the back, keeping it reasonable short. You need to make sure that most of the length remains at the top of the head; the longer strands towards the forehead. The last strand lops like a natural curl at the forehead, making the hairstyle very appealing. You heard it right. Little boy’s curly hair too can be slicked back. You can leave the long strands of curly hair up top, with shorter lengths on the sides and the back. With the right products – a strong styling gel if your kid has very tight curls, you can slick back the hair, so that the front portion remains straight, but they end in loose curls. The simple and traditional way to handle curls is to simply have it cut in a bob. A bob gives a nice shape to the head and allows the curls to set well, depending on the shape of the face and the head in particular. Little boy haircuts are every parent’s headache and delight. A young boy’s hair is soft and needs to be dealt with carefully. meanwhile, you can experiment with it until you hit upon the right choice. As we have seen above, there is no dearth of choices for any kind of hair. everything works, provided you keep in mind a few simple tips.